This match was the moment in which it truly felt as though the English Premier League season got underway. With the first, awkward, international break out of the way the visit of Liverpool to Wembley Stadium to face Spurs had the feeling of a clash of genuine heavyweights. Indeed, if ever there was one this was a match that deserved an analysis piece. There was also an intriguing sense of contrast around the two clubs coming into this match. Spurs had hoped that this high profile game would herald the opening of their new fully redeveloped stadium, instead, they find themselves extending their stay at Wembley with a significant delay in having the ground made ready. Beyond that, though fans of the club will still point at the lack of investment over the summer transfer window which combined with a busy World Cup period for many of their players has left the first team squad looking sluggish and out of rhythm. Some are pointing to the fact that spending on the new stadium has perhaps limited the ability of the club to compete and spend in the transfer market, a possibility that draws comparisons to their North London rivals, Arsenal, who underwent the same period of transition when building the Emirates Stadium. Liverpool, on the other hand, have moved to fully back coach Jurgen Klopp in the summer transfer window. 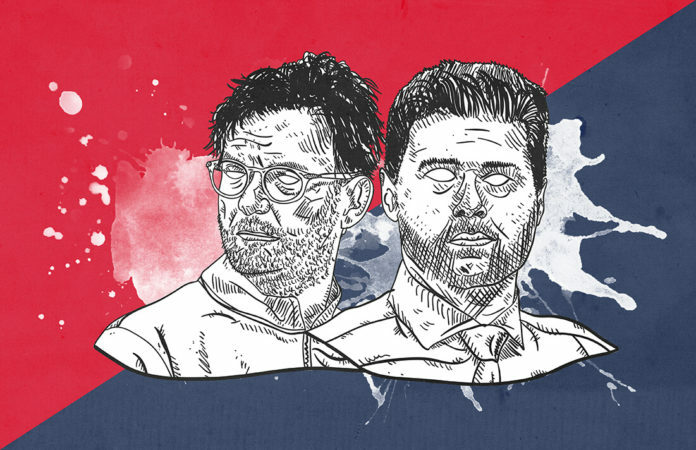 A fourth-place league finish last term was coupled with an appearance in the Champions League final and there exists a real belief around the club that they now have the quality, and perhaps crucially, the experience to compete at the highest level. The signings in the summer of Alisson and Fabinho have given depth and quality to the squad with Guinean international midfielder Naby Keita also arriving on a pre-arranged transfer. Now Liverpool have the feel of a team to be feared. The first thing to note from the selected teams came in the orientation of the defensive line for Spurs who chose to line up with a back four that saw Toby Alderweireld and Jan Vertonghen selected centrally with no place for the Colombian international Davinson Sanchez. Eric Dier was selected to solidify the base of the midfield whilst Harry Kane continued in attack despite his struggles so far this term. Jurgen Klopp and Liverpool came into this match with one eye on their upcoming Champions League match with PSG and whilst the defensive and attacking units remained unchanged there was rotation in midfield. England international Jordan Henderson dropped down to the bench with Naby Keita coming back in having been rested in the last league outing. This saw Klopp continue to utilise the Dutch international Georginio Wijnaldum as the organising midfielder, the ‘6’. In modern football adaptability and versatility are traits to be coveted. There is perhaps no other side in the Premier League as versatile tactically as Spurs have been to this point in the season under Mauricio Pochettino. They have switched from a back three to a back four several times already this term, seemingly in response to their upcoming opponent. In this match, Pochettino chose to go with a back four with Eric Dier drafted in to sit in front of the defence to shield the central areas. Further forward they remained narrow with Lucas Moura drifting situationally into the wide areas and linking in centrally with Harry Kane. 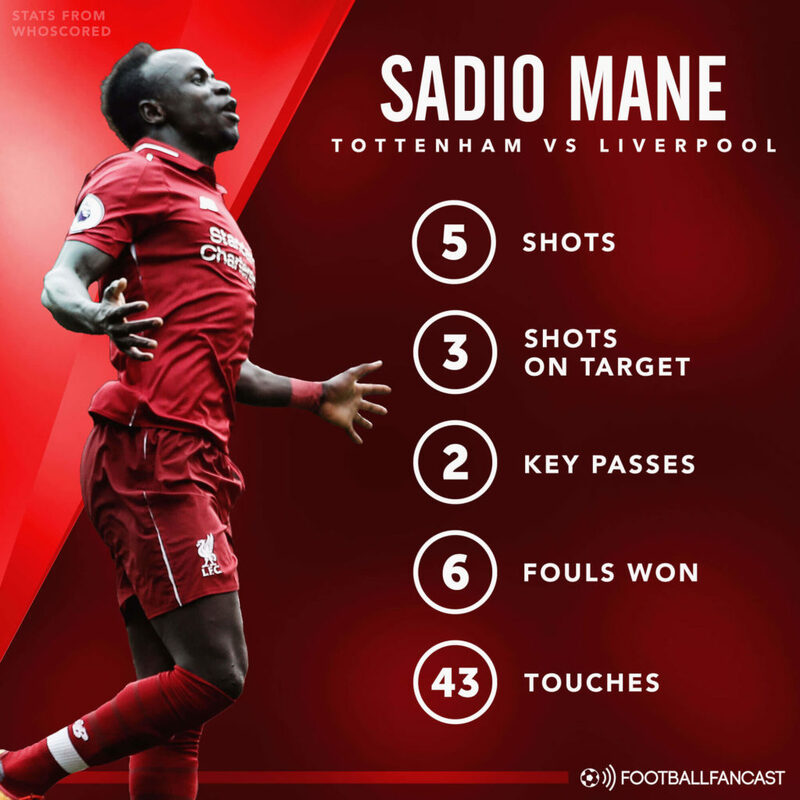 The defensive issues for Spurs, however, stemmed from the attacking movements and positioning of the Liverpool front three who were able to take advantage of spaces in the Spurs defensive structure to threaten in the final third over and over again. Liverpool possesses arguably the most frightening attacking three in World football with Sadio Mane on the left, Mohammed Salah on the right and Roberto Firmino centrally. The key to this front three is that they work so well as a unit, something that is directly due to their individual player ID. With Firmino as the 9, we expect to see him dropping deep to link with the midfield, Mane plays from the left but tends to favour the half space, if not the central area and the same can be said of Salah on the right. All of this together means that when facing the back four of Spurs the Liverpool forwards found themselves constantly in pockets of space. The above image illustrates my point. If the Spurs back line attempt to remain in a fixed position and defend zonally then the forwards for Liverpool are positioned to take advantage of the spaces in the final third. The Spurs defence would then be further stretched by the Liverpool fullbacks who move high in the attacking phase to offer the wide option as the wide forwards move inside. Both Trent Alexander-Arnold and Andrew Robertson are extremely effective in the attacking phase. If Spurs had lined up with a back three then the spaces available to the Liverpool attackers would have been negated by the defensive block. 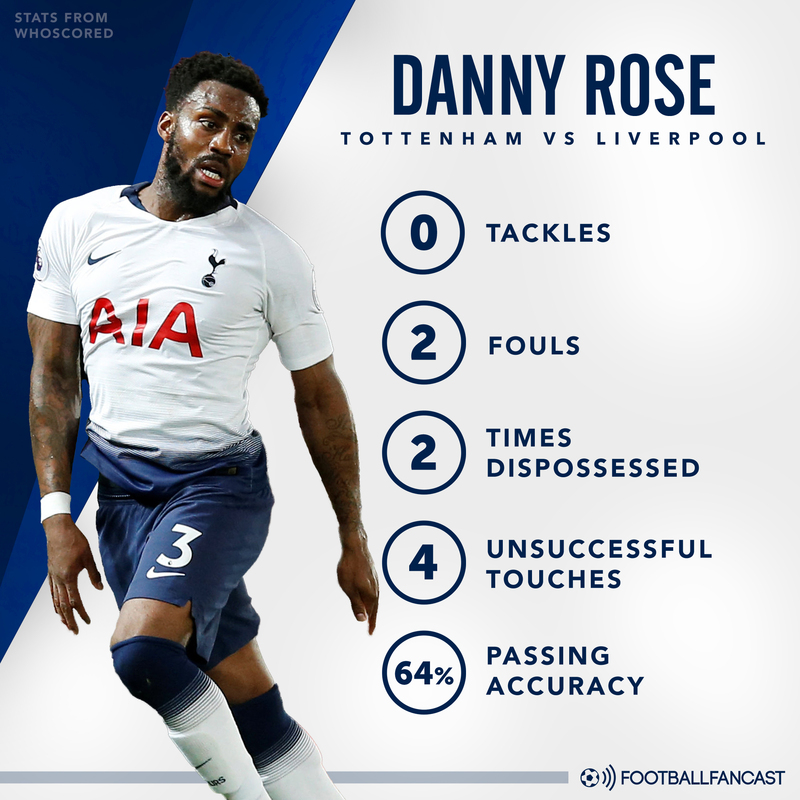 The three central defenders combined with the controlling midfielder, Dier, and the wingbacks would have given further defensive solidity and denied Liverpool the space in the final third that they ended up enjoying. Liverpool are not the counter-pressing machine that many expected that they would become under Jurgen Klopp, but they are excellent at choosing the right situations in which to press their opponents high in order to disrupt their attacking build-up. In this match, the pressing of Liverpool as Spurs looked to begin their attacking phase was a key feature. Here Spurs were looking to progress the ball forwards down their right side with the goalkeeper playing out to Alderweireld and the ball then being rotated out to Kieran Tripper at right back. This pass out to Tripper trips a pressing trigger for Liverpool and they move in quickly to disrupt the space and time that Spurs have to play out of this situation. Firmino as the central striker ensures there is no easy pass back to the centre back whilst Keita and Mane press the man in possession and cover the potential pass back inside respectively. With no winger playing ahead of Trippier the only chance to progress the ball down the line is for Tripper to take the pressing man on and beat them, this possibility, however, is covered by Wijnaldum offering depth to the press and covering the threat in the wide area. In this example Spurs were able to progress the ball to the halfway line where the Belgian international Moussa Dembele took possession, he received the ball through facing his own goal. Once again this immediately triggered a pressing movement with Liverpool able to cover man to man the easy passing options available to Dembele and Naby Keita moved to quickly press the blind side of Dembele before winning the ball back. For the majority of the last season, Jurgen Klopp preferred to use Georgino Wijnaldum as an ‘8’ in midfield with Jordan Henderson playing as the ‘6’. With the reinforcements to the Liverpool midfield this season, however, in the shape of Keita and Fabinho, Klopp now has the capacity to be more flexible with his use of midfield players. I have long held the opinion that Wijnaldum is well suited as a ‘6’ his capacity to play to either the left or the right of the field and the balance with which he plays gives the team incredible depth of options as they move in the attacking phase. The above graphic shows what I mean by balance to the left and the right of play. It may seem like a small thing but there is a tendency, even amongst professional players, to favour the side of the field that is more natural to them. 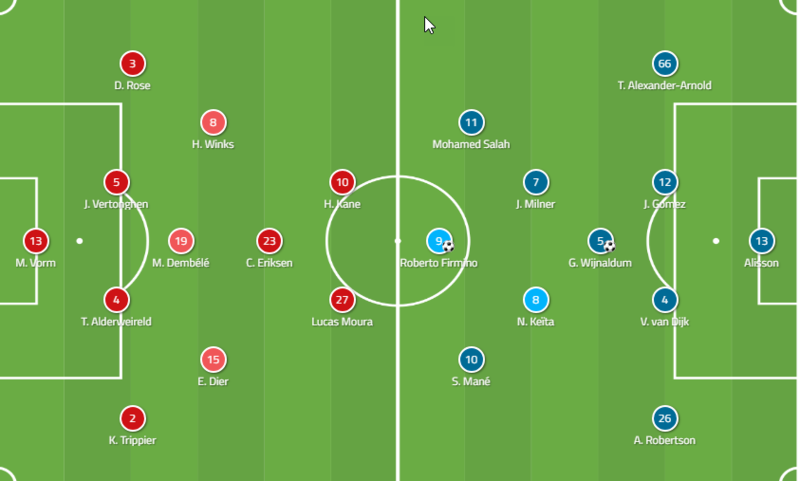 A left-footed player in the central area, for example, would naturally look to play out to that side while a right-footed player in the same role would favour the right of the pitch. Having a player like Wijnaldum in this role, therefore, gives the option of the ball being progressed down either side given his ability to play from either foot comfortably. A small difference but a decisive one. In the end, this match did not live quite up to expectations from a quality point of view. Both sides were somewhat sluggish compared to the norm but if anything this makes the Liverpool victory all the more impressive. Liverpool were efficient and strong across the pitch and that they managed to win the match whilst not playing their best comfortably. This raises the question, will anyone be able to stop this Liverpool side when they reach their full stride?